Miloš Zeman visited the Western Wall and said that when he made a wish there, 12 years ago, it came true. 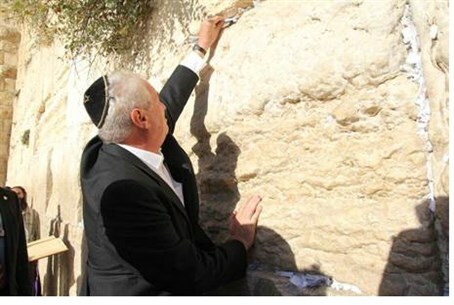 Czech President Miloš Zeman visited the Western Wall (Kotel) Sunday in the course of his official visit to Israel. Zeman told the Rabbi in Charge of the Western Wall, Rabbi Shmuel Rabinovich, that this is his second visit to the holy site. Twelve years ago, Zeman visited the Kotel when he was prime minister. He placed a note with a written request to G-d between the stones of the Wall, as is customary. The wish later came true, he told the rabbi. Zeman placed a new note with a new wish on it in the cracks between the stones on Sunday's visit as well. "I am excited to stand here in front of the holy stones, this exalted place of worship, with the prayer books that accompany the Jewish people everywhere in the world. Here and in Prague, people pray from the same prayerbook,” he noted. The Western Wall is a remainder of the outer wall of the compound originaly built by King Solomon, which housed the First Jewish Temple, and later, the Second Temple. The Temples stood for about 1,000 years, with a 70-year interval between the destruction of the first and the building of the second, until the Second Temple was destroyed by Rome in the year 70 CE. The Wall has been a place of Jewish worship and longing for the rebuilding of the Temple for many centuries.